A couple of weeks ago a work trip took me to the island of Puerto Rico. Many people think that living in Cayman means that you can easily hop over to any of the other Caribbean islands and South America - a pre-conception I moved to the island with. The reality is that Cayman is really quite far out on it's own, and you can only fly direct to Jamaica, Cuba and Honduras. But don't feel too sorry for us because you can get pretty much anywhere via Miami. So 2 flights and 7 hours after leaving home I touched down in San Juan, PR, eager to see a new city. What struck me almost immediately was the topography. Cayman is flat. Puerto Rico is not (and neither is Trinidad or many of the other islands by the way) and it was so nice to see hills, mountains and thick vegetation! Puerto Rico is home to a fabulous rainforest, El Junque, which I'll have to explore on my next trip as on this occasion I only had a couple of days and most of them were taken up with meetings. I went straight to my hotel in Condado to dump my bags before catching a cab into the old town - one thing I don't miss about metropolitan life is the traffic! 4 lanes in each direction on every road was a bit of shock to the system, and rush hour? Argghhhh - Ive got sights to see! I made to Old San Juan by mid afternoon, starting at Plaza Colon and working my way up the cobbled streets to the Melancon and the old fort. The cobbled streets and Spanish style buildings are absolutely beautiful and made for a lovely few hours of wandering around, peering in shops, taking in the architecture and stopping for a local beer in one of the many bars and restaurants which spill out onto the streets. The next day I had the evening free from work colleagues so I came back into San Juan Viejo for dinner at a simple but delicious tapas restaurant before heading back to Condado for a desert and a cocktail. Whilst Old San Juan is the historical centre of Puerto Rico, Condado is the "strip" which runs along the beach and is home to many hotels as well as bars, restaurants and the essential tourist tat shops! 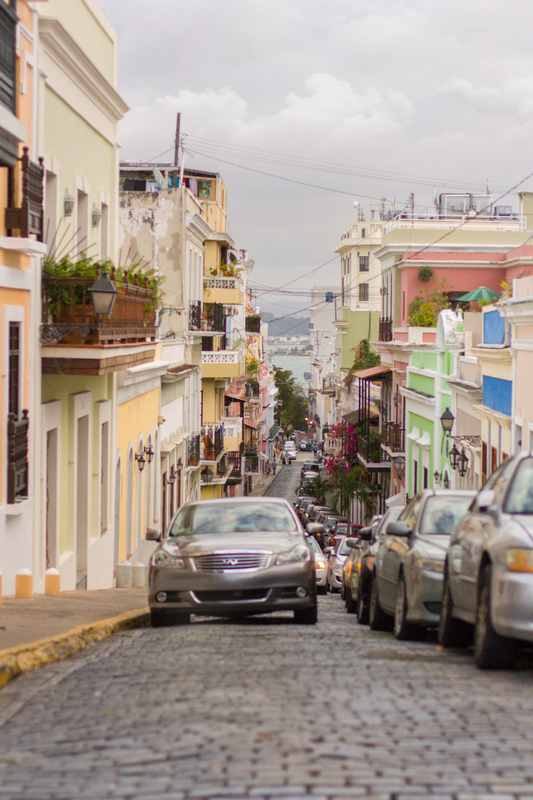 Its as popular with locals as it is with holiday makers and from what I understand is pretty much the safest area in San Juan - perfect for an evening stroll. Whilst I didn't have long in Puerto Rico I tried my best to soak up as much as possible of the local culture which to me centers around museums, architecture and food! On my last night I tried the local specialty called Mofongo - basically a stew served in a plantain bowl. It was seriously good - and I don't even like Plantain! I don't have a picture but if you want to try it, here's a link to a recipe which looks bang on what I had. In summary, Puerto Rico seems to have a lot to offer from rainforest to beaches and is full of friendly people. My opinion of San Juan itself is that it's something of a poor man's Spain. If you've been to the real thing, you probably want to focus your time on the rainforest. But if you've never been to Europe, it will certainly give you a taste of it. And it reminded me just a little bit of Europe and home.